Amy Ross is an engineer who has been designing and building new spacesuits for NASA since the ‘90s. We sat down with her to find out what the spacesuits of the future will look like, and what we need to do before our spacesuits can let us live our lives on Mars—and maybe beyond. Top image: Artist’s concept of astronauts on Mars / Ren Wicks, NASA. io9: One of the things I’m most curious about is what spacesuits will look like when we start moving towards longer stays in space. What kinds of things are we going to have to do to prepare for that? Amy Ross: One thing we’re going to have to make sure is they’re a lot more customized for the individual. Say you’re going to Mars for 500 days. Your spacesuit is now your work coveralls. My Gramps was a farmer, he had coveralls he put on every day and that was his work uniform. He had them just how we wanted them, with his tools in all the right spots and it helped him do his job. That’s kind of how I think about a suit for a Mars mission. You’re going to want to make sure it’s just right for the crew member. You’re going to customize it in certain ways and you’re also going to help them be a lot more independent in doing their jobs. We’re trying to be creative and really push the tech to incorporate information technology in the spacesuits. Like if it has a display, you’re going to be able to interact with that hands-free, ideally. We’re not quite sure how that’s going to work yet, but, as they’re doing their job, they could keep track of their own performance, health, the timeline, the to-do list. If something pops up and they need to fix it, they can pull up the schematics. And we also want to pay attention—because it is something like a tool, like a work uniform—so the word we use a lot is comfort. But what that really means is lack of injury-causing issues. Image: Prototype lunar spacesuits getting a test on Earth / NASA. Ross: Right now we’re working on the Z2 and preparing to test Z2 in the vacuum chamber. What kinds of missions are you getting Z2 ready for? Ross: So for the Z2, the configuration is for a planetary surface walking suit. We’re thinking about missions like a lunar mission or a Martian mission. However, it could also be used for other exploration missions. Part of the testing we’re going to do is to see how it will do in microgravity environments as well. So the environments will vary quite a bit. You could have a vacuum environment or a flight atmosphere environment. You could have a dusty environment or a dust-free environment. The thermal environments will change based on where you go as well. What we’ve done—and my job—is to make sure that we’ve looked at all the different missions that you could be able to do and make sure that our designs bracket anything you might want to do. There’s a few outliers like going down into permanently shadowed craters on the moon, places you don’t even really want to send a robot because it’s kind of mean, so we’re not going to have our humans go there. But I’m looking at materials and layouts and insulations that can take deep space missions transit, EVA, Mars surface in different seasons and different locations, lunar surface from poles to equators. Because we don’t have a specific mission for this kind of a suit, and we are going to test it on the space station, we can use the same kind of environmental protections they use on the ISS. So we don’t have to get too creative yet… but I’m working on it. Image: Artist’s concept of Z2 in action / NASA. When you design a spacesuit, what kinds of places are you looking for inspiration? Are you looking mostly at previous spacesuits? Talking to astronauts to see what they would like added? Are there any unexpected sources of inspiration that you go to? Ross: Yes to all of the above. We try to have a variety of folks on the team and we try to bring in all kinds of different ideas, because all of it is helpful. Yes, you have to listen to your customer—what’s their experience in working in spacesuits, what do they need, how can we help them—and then, yes, you need to know your history. Any good scholar or engineer needs to know what’s been done and what hasn’t been done, how successful things were, and why or why not. We’ve got a research library here and we stay educated on our past. But then, I’ve also got a guy who sails a lot. So when we’re trying to solve a problem, he’s like, well, this is how we do it in sailing. Or I’ve got people who do other kinds of stuff—climbing, bicycling—one guy likes to work on his car. So they bring their different life experiences to the team. We also try to look at nature and get inspired by, how does nature solve this problem. So any place you can get inspiration, we try to bring it in and stay open to creative solutions. Another way we bring in new ideas is we bring in a lot of student interns with all kinds of life experiences. And their educational experience has been a little bit different and their exposure to technology is different than what I had as well. Image: Timeline of different spacesuits, previosly featured here / by redditors mareacaspica and imaginedmind. What do you think of pop culture responses to spacesuit design? For instance I’ve mentioned to you that I’ve been calling the Z2 the Tron spacesuit [ed note: for obvious reasons], I’ve also heard people call it the Buzz Lightyear spacesuit. Do you ever think about fictional designs when you’re creating real spacesuits? Ross: It’s kind of a little frustrating. We’re engineers, and this is space hardware. So a game I used to play with my mentor is “Why is this feature on the suit?” Because this is a very highly engineered product. If there’s a feature there, it’s there for a reason, not just because it looks cool. As fun as that would be, we don’t get that luxury very often. So with Z1 and Z2, we’ve been given that freedom to think a little bit about what it looks like, and it’s been a lot of fun because spacesuits are cool. We all grew up with these movies too. Hollywood has some really neat things going on and with commercial space coming up, everybody wants to look cool as an astronaut. We don’t usually get to do that but with Z1 and Z2 we really had the opportunity to think a little more about what it’s going to look like. Image: Left, NASA’s Z1 prototype Spacesuit (a.k.a. the Buzz Lightyear). Right, NASA’s Z2 prototype spacesuit (a.k.a. the Tron) / NASA. There’s some pretty cool theoretical spacesuit designs floating around out there, too. I especially liked that biosuit Dava Newman put together a few years back. And what really struck me about it was how different it was from the bulkier spacesuit designs that we almost uniformly see. Why are spacesuits today so bulky and how far away are we from that kind of shiny, space jumpsuit? Ross: The biosuit is a variation of a system developed by Paul Webb in the ‘60s, called the space activity suit. The idea of a mechanical pressure suit has been around for quite awhile. You have to apply pressure to the body, either by air pressure, pneumatically, like in an inflated spacesuit like we use today, or mechanically, so really tight fabric—think of spanx on steroids. When you put a shell on a human, that makes a human look big. So think of the spacesuit as an exoskeleton. Even something like a cat, if you put an exoskeleton on a cat, the cat’s going to look huge. But it really isn’t. When you’re inside of it, that suit fits you and you can do what you need to do. The impression is that it’s bulky. But some of my spacesuits, which people don’t get to see move as much, can move. Like I’ve got an image of someone doing a headstand in one of my spacesuits. You don’t get to see that in microgravity because that’s not how you move in microgravity. And when you’re looking at the spacesuit on the moon, that spacesuit had to do three different jobs in one. But I’ve got the luxury of just doing the job of planetary surface movement in my suit, and I can make it do that job pretty darn well. To get [a slimmer biosuit] to be a reality, material development is key. Recently one of Dava’s PhD candidates did a fellowship with NASA on making materials that would make the concept more feasible. Right now we’re a good 25-50 years out, unless materials development accelerates more than it ever has before, in order to be able to make that suit some kind of a flight spacesuit. Image: Newman’s biosuit / MIT. What would your dream future spacesuit look like, and what kinds of features would it include? Ross: So one thing that’s always been fun for me to think about is if your suit could adapt to your own mobility, like as you’re moving. Say I want to do something overhead and reach up. If my suit could see that’s what I’m doing, and help me move the joints around so that I could do that better, and then when I go back to reach down to touch the ground again those joints could move to help me do that better. I’d like that. That would be fantastic. It would be a tool that’s really helping you do your job. But that’s pretty far out there. 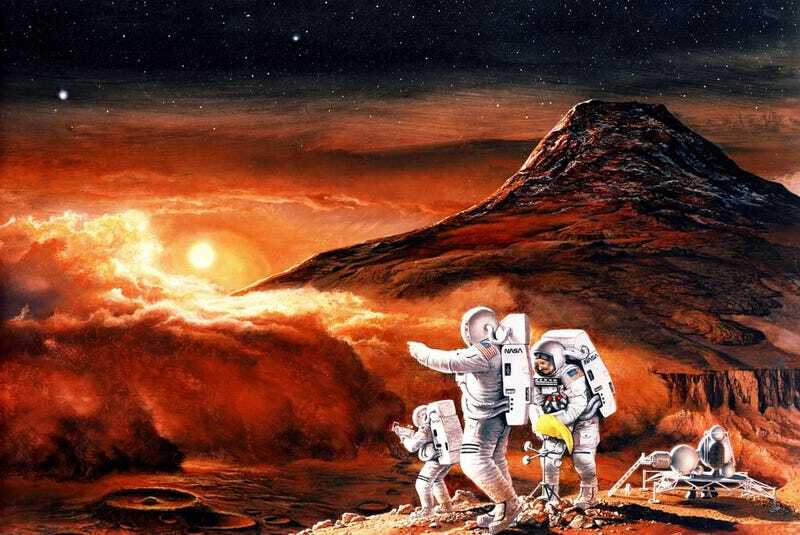 Image: Artist’s concept of astronauts on Mars / NASA/ JPL-Caltech.